Product prices and availability are accurate as of 2019-04-05 03:57:05 UTC and are subject to change. Any price and availability information displayed on http://www.amazon.com/ at the time of purchase will apply to the purchase of this product. Finally - A Cooling Rack That Ticks Every Box! 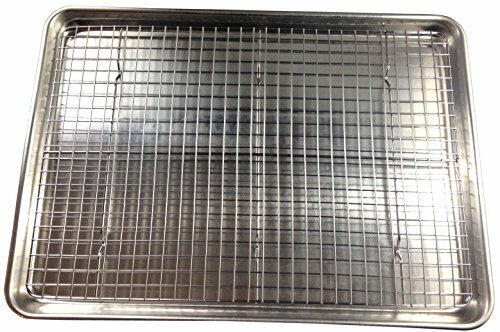 Achieving perfect scores for both “Cleanup” and “Strength and Stability” in recent product testing, the Checkered Chef Cooling Rack is proud to be “Highly Recommended” by Cook’s Country (America’s Test Kitchen). Sturdy, strong and versatile - no kitchen should be without one. Sick of flimsy racks that warp and twist? Unlike others on the market the Checkered Chef cooling rack has been strengthened to prevent warping. The secret? To complement the 3 crossbars we've added an additional rod running through the center of the rack. The result? A stronger, sturdier rack that will resist warping and wobbling. Cooling or Cooking - the choice is yours with our oven safe rack. That's right, as it's made from 100% stainless steel with no artificial coatings or treatments, our rack can be used not just for cooling but for baking and roasting too. Sized to fit perfectly inside your standard 18" x 13" half sheet pans, you'll soon be cooking up a storm - crispy chicken wings anyone? The generous size also allows plenty of space for cooling cakes, a whole tray of cookies and more. And when you're done, wash up is easy. Simply hand wash or pop it in the dishwasher! Buy from the brand you can trust - backed by Checkered Chef's 100% satisfaction guarantee. Whether you need a wire cooling rack, or a wire rack for baking, grab yours today by clicking the "Add to Cart" tab above. Cooling or cooking - the choice is yours! With solid stainless steel construction and no artificial coatings or treatments our rack is safe for using in the oven too! 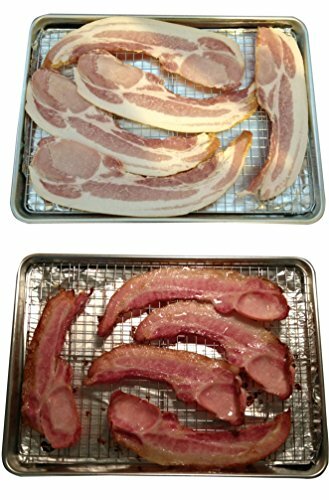 Ever tried oven baked bacon? How about some crispy chicken wings? The perfect size! Designed to fit perfectly inside a standard 18" x 13" half sheet pan, you'll be cooking up a storm in no time. Nice generous size for cooling cakes, cookies and more. Sick of flimsy racks that warp and twist? 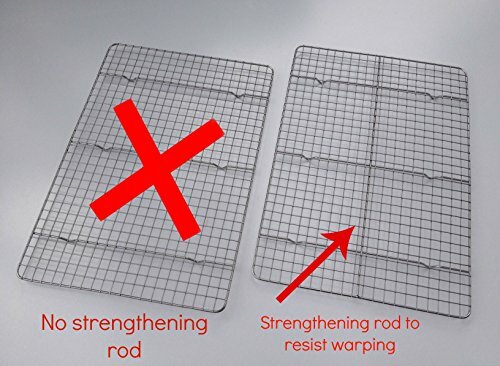 Made from 100% stainless steel for maximum strength and durability, we've also added a unique strengthening cross bar to resist warping and wobbling. No more cookies sliding through the gaps! Our perfectly spaced grid pattern optimises airflow and prevents your treats from falling through. Wash up is a breeze! Our racks can safely be washed in the dishwasher without corrosion or rust.